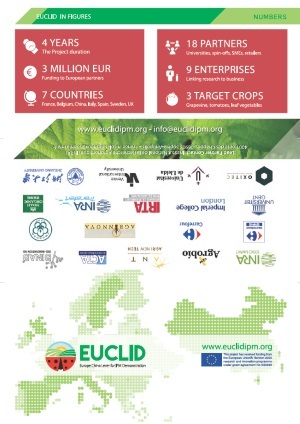 The EUCLID Project aims at developing several documents targeting the different stakeholders and supporting sustainable pest management, food security, food safety and environmental protection. One of the final objectives of EUCLID is to offer substantial contribution to the international scientific community by regularly publishing in dedicated journals, books, or other proper scientific media. EUCLID Project develops documents meant to guide the farmers to an effective pest management. 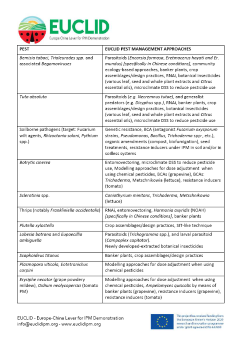 EUCLID Project develops documents meant to support firms to be competitive in the production of low-pesticide agricultural products. EUCLID Project develops documents meant to inform consumers about IPM, pesticide residues and food quality. EUCLID Project develops documents meant to support policy makers in the development of sound policies for promoting a sustainable pest management. Euclid IPM Project All Rights Reserved. This project has received funding from the European Union's Horizon 2020 research and innovation programme. Grant agreement no 633999.